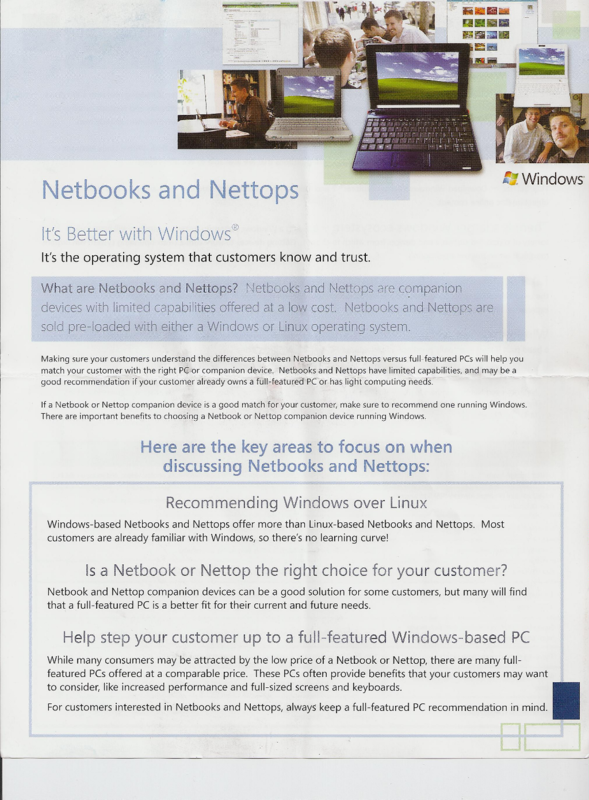 Microsoft propaganda handed out to Staples employees. 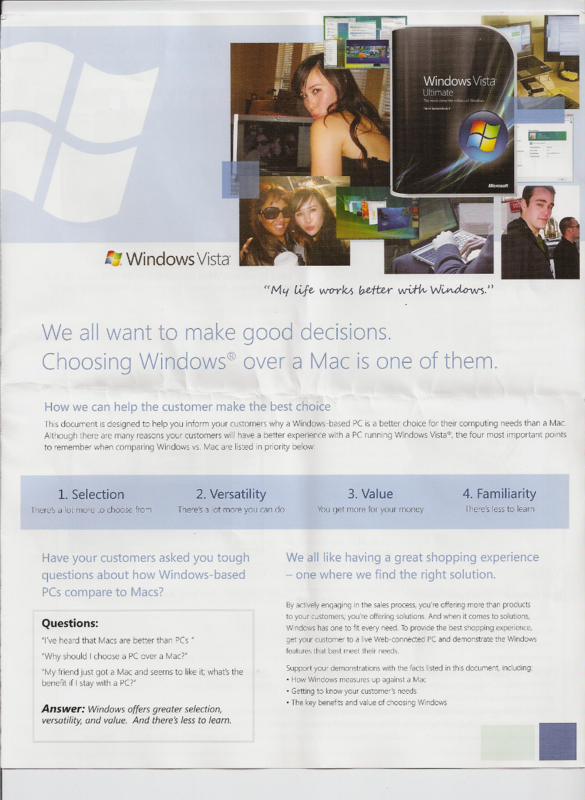 I thought I’d post these images of Microsoft’s propaganda they’ve been distributing to Staples employees. Numerous lies like greater compatibility than GNU/Linux-when most of the older hardware won’t work with MS Windows Vista. GNU/Linux is compatible with more hardware than any operating system in history. It may not work with some of the latest and greatest-but for the most part it works better. I don’t spend 3 hours fiddling with installing my printer drivers. I plug it in- and it just appears as an option in whatever program I need to print with. The learning curve for GNU/Linux is generally not as high as it is for MS Windows Vista. Unlike what they claim MS Vista and MS Office 2007 software which customers would buy if they got Vista is more cumbersome, has a reduced feature set, is slow, lacks important features like PDF support, and so on. GNU/Linux has better support generally than MS Windows. GNU/Linux supports stuff out of the box whereas with MS Windows users hand to install lots of bloated software, drivers, and waste time figuring out how to use it. GNU/Linux on the other hand can generally be had without such support headaches. Once you’re introduced to shut down, applications menu, saving in different formats, and exporting to PDF it is just simpler. Getting devices to work in MS Windows can require modification/and or troubleshooting. Hardware rarely works out of the box. 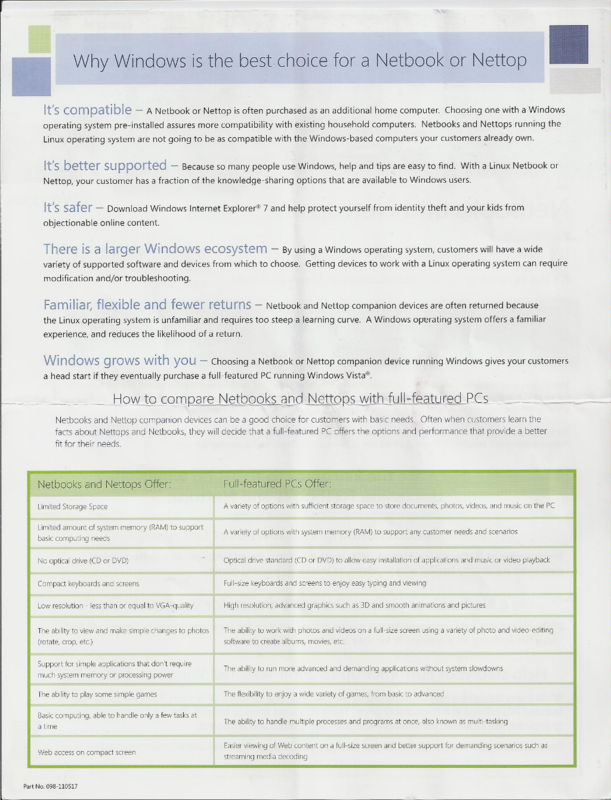 Microsoft want’s you to believe that GNU/Linux netbooks have a higher return rate. The fact is that some manufacturers screwed up their GNU/Linux introductions to customers and their particular return rates were higher. Overall GNU/Linux is on part with MS Windows. This entry was posted on September 6, 2009 at 3:04 am and is filed under Uncategorized. You can follow any responses to this entry through the RSS 2.0 feed. You can leave a response, or trackback from your own site. Is anyone from the Linux format sending similar propaganda against Windows to these companies? Have they thought about it? I think it would be a good idea to do so, and dispell much of the BS that MS is putting forth. Not that is getting through to the employees. The Free Software Foundation did a campaign against Apple recently where they asked people to show up at Apple stores and confront Apple employees. I’m sure allot of good that did. Before I read this note, I just posted the following on another site. Very good move by the FSF and should carry through by rallying qualified volunteers to swarm the stores of both retailer to counter this campaign by MS. There are no reasons or indications to suspect these slides of being fake. If they were not genuinely produced or used by MS/Best Buy, they would have come out already and said so. They haven’t done that yet. With the majority of the posts on the Internet refuting the contents of these slides, Best Buy have a big problem on their hands. Their trustworthiness is on the line. Consumers will no longer believe they are getting the best buy as advocated in the name. If Best Buy still care about their customers and believe they are offering them “best buys” and Windows is really better than Linux, then they have to prove it by demonstration. That is not so difficult to do. All they have to do is to also make Linux available on in-store computers for customers to compare. If they don’t do that, then Best Buy are deceiving their customer and no longer can be trusted. Check out http://www.thinkpenguin.com … If I can help it Microsoft won’t win in the long term. The thing is you can’t contribute to Microsoft and then expect manufacturers to support Linux. You need to show you aren’t willing to pay for MS Windows and then show are willing to pay those companies who are supporting Linux if you want better support. Despite what the Staples tech guys say I would never buy a laptop with MS Windows on it intending to install Linux later- you’ll only be disappointed. Be it the wifi, graphics, suspend to ram, audio, optical drive, or some other feature doesn’t work properly. Just because you turn it on and the audio work and the screen comes up doesn’t mean Linux works on the laptop and chances are that is what the Staples tech guys did. It might work with the Internet. But did they install it? Did they test the 3d acceleration works with suspend to ram? How about burning a CD? Yea- chances are cd burning works but the suspend to ram very well won’t work with a non-free driver. So you won’t get a real good experience from a non-free ms windows designed laptop. Go buy a GNU/Linux laptop and come back and tell me how it compares to a MS Windows laptop with MS Windows on it- you’ll be amazed at how much better the Linux laptop is. You’ll get a comparable experience to a typical Mac if the laptop was ACTUALLY designed for Linux. These documents spend a lot of time talking about limitations that are tied to the hardware, not the OS. If I remember what I have read elsewhere correctly, most of the current hardware limitations were imposed by Microsoft as a condition for loading the cheap XP Home (and soon 7 Starter Edition). It’s only a matter of time before we will see higher-powered netbooks that can do everything listed here, but only with Linux. What we need in the GNU/Linux world is a source for GNU/Linux products and a place to get decent support. Normally people would call Dell or whoever supplied them the computer-at least while it is under warranty. The major supplier of for GNU/Linux computers presumably is Dell right now (they may not sell more GNU/Linux computers than smaller suppliers- but the company itself is larger than all others). Dell already provides low quality support. Add GNU/Linux to a Dell PC at checkout and you get little to no support-despite it being an option on some computers. If you actually do call Dell you’ll just be redirected to a company that doesn’t provide free support (Canonical) even to Dell’s own customers. Not to mention the Canonical isn’t open on the weekends (at least not for mere mortals). Stupid FUD is all it is. The best part is all Microsoft have done is draw peoples attention to that fact Linux exists and is a threat to their core business. This training says Linux is so good Microsoft are scared your employer will start selling it! I bought a second hand eeepc 701 from ebay, it arrived yesterday. It was running that dreadful version of Xandros, so I installed eeebuntu. Everything worked out of the box, and excellently. Even MythTV Frontend…and Compiz et al. A friend saw it this morning, and went home and got the one he bought his girlfriend that came pre-installed with XP. She booted it up to have a look to see what, if anything, she needed to save off of the machine to my NAS. After waiting around 10 minutes for the ‘start menu’ to actually display, she said “Ahh…f**k it, just get rid of it – I want it to be as fast as yours is”. I duly installed eeebuntu, and now the machine is usable again. …as a side note, if Vista has such a shallow learning curve (as claimed in the propaganda), then how is it that (as a Linux ‘dabbler’) that installing Vista on my machine and using it for 6 months pushed me into become a fully-fledged Linux user? Don’t even get me started on Office 2007 – I’m more-or-less forced into using it at work. After trying to write a simple letter for over 15 minutes, I gave up, downloaded Open-Office for boody Windows, and wrote the letter.